The location of the brightest spot in the flare in screen coordinates. It can be set by enabling and moving the hotspot widget. The hotspot parameter is ignored if the AutoTrack effect option is selected. Pivot: X & Y, Default: [0 0], Range: any, Shared . The elements of the flare will be in a line between the Hotspot and the Pivot locations. The Pivot is in screen coordinates relative to the center of the frame. Scale Widths: Default: 1, Range: 0 or greater, Shared . Rel Heights: Default: 1, Range: 0 or greater, Shared . Lens: Default: 0, Range: 0 or greater, Shared . Hotspot Bright: Default: 1, Range: 0 or greater, Shared . Rays Brightness: Default: 1, Range: 0 or greater, Shared . Gamma: Default: 1, Range: 0.1 or greater, Shared . Saturation: Default: 1, Range: any, Shared . Hotspot Color: Default rgb: [1 1 1], Shared . Other Brightness: Default: 1, Range: 0 or greater, Shared . Blur Flare: Default: 0, Range: 0 or greater, Shared . Tint Back Whites: Check-box, Default: off, Shared . These parameters allow further adjustment of the hotspot, and enabling of the screen interface widgets. Rays Rotate: Default: 0, Range: any, Shared . Rays Num Scale: Default: 1, Range: 0 or greater, Shared . Rays Length: Default: 1, Range: 0 or greater, Shared . Rays Thickness: Default: 1, Range: 0 or greater, Shared . Other Width: Default: 1, Range: 0 or greater, Shared . Other Color: Default rgb: [1 1 1], Shared . Hotspot Shift: X & Y, Default: [0 0], Range: any, Shared . Adds this amount to the hotspot location. This can be helpful if you want the hotspot to follow tracker data. If enabled, the hotspot shift parameter is negated before affecting the hotspot. Edge Width: Default: 0, Range: 0 or greater, Shared . Edge Falloff: Default: 2, Range: 0.01 or greater, Shared . One Way: Check-box, Default: off, Shared . Show Edge Zones: Check-box, Default: off, Shared . Center Radius: Default: 0, Range: 0 or greater, Shared . Center Falloff: Default: 1, Range: 0.01 or greater, Shared . Edge Scale Brtness: Default: 3, Range: 0 or greater, Shared . Edge Scale Widths: Default: 2, Range: 0 or greater, Shared . Center Scale Brtnss: Default: 2, Range: 0 or greater, Shared . Center Scale Widths: Default: 1.5, Range: 0 or greater, Shared . Occlusion Scale Brt: Default: 1, Range: 0 or greater, Shared . Enables a Trigger that adjusts the brighness of the flare as it's occluded. The brightness will ramp up to this value when the Hotspot is 50 percent occluded, then ramp back down to its normal brightness. 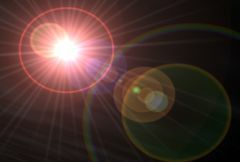 At the same time, the flare will be fading out due to the occlusion, so its brightness will drop off quickly at the end. Works best when Occlusion Softness is turned up as well. This feature only works with Luma masks. Occlusion Scale Wdth: Default: 1, Range: 0 or greater, Shared . Enables a Trigger that adjusts the size of the flare as it's occluded. The flare will expand up to this amount when the Hotspot is 50 percent occluded, then shrink back down to its normal size. At the same time, the flare will be fading out due to the occlusion, so it will appear to shrink quickly at the end. Works best when Occlusion Softness is turned up as well. This feature only works with Luma masks. Show Center Zone: Check-box, Default: off, Shared . Diffraction Glow: Default: 0, Range: 0 or greater, Shared . Creates a glow on the edges of occluding objects that are near the hotspot, to simulate light bleeding around the edges of the object. This parameter controls the brightness of the glow. This feature only works with Luma masks. Glow Width: Default: 0.4, Range: 0 or greater, Shared . Glow Color: Default rgb: [1 1 1], Shared . Glow Radius: Default: 0.2, Range: 0 or greater, Shared . Flicker Amp: Default: 0, Range: 0 or greater, Shared . Flicker Speed: Default: 1, Range: 0 or greater, Shared .